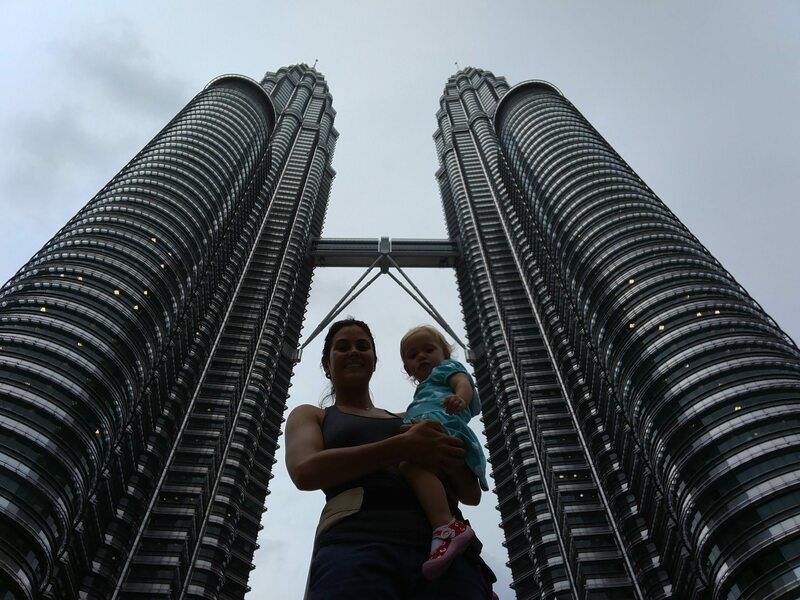 When you travel with a toddler, you’re going to miss a few destinations and sites here and there. That’s to be expected because there are nap times, eating schedules, and early bed times to think about. Jannika and I have never been the ‘take a picture and move on’ type of travelers anyway, so it works out. However, to eliminate any stress from a short visit to any destination you should think about what you want to get out of that destination before you arrive. If ‘go here, go there, see this, see that all in a day’ is you’re style, do it. 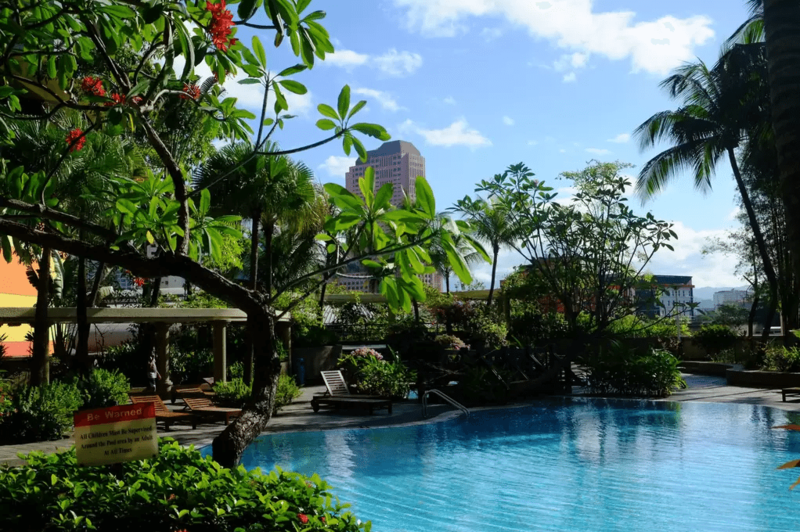 For us, with a toddler, we try to do one thing per day… and in Kuala Lumpur, it was the markets… and the pool! 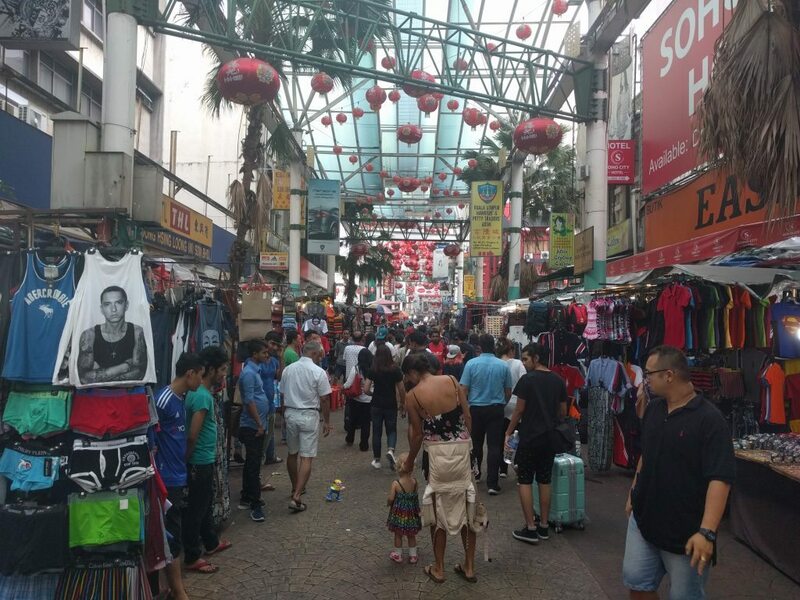 During our five nights (4 full days) in Kuala Lumpur we went to the Chow Kit Market, the Jalan Alor Food Street and the Petaling Street Market. Jannika and I love markets because the the food is usually local and authentic, and it’s great sensory overload for Freya. Markets are packed with people and goods that keep Freya entertained throughout the visit. We also spent time just relaxing at the amazing pool that our AirBnB accommodation had on site… because, pools! We love pools! And Freya loves pools! 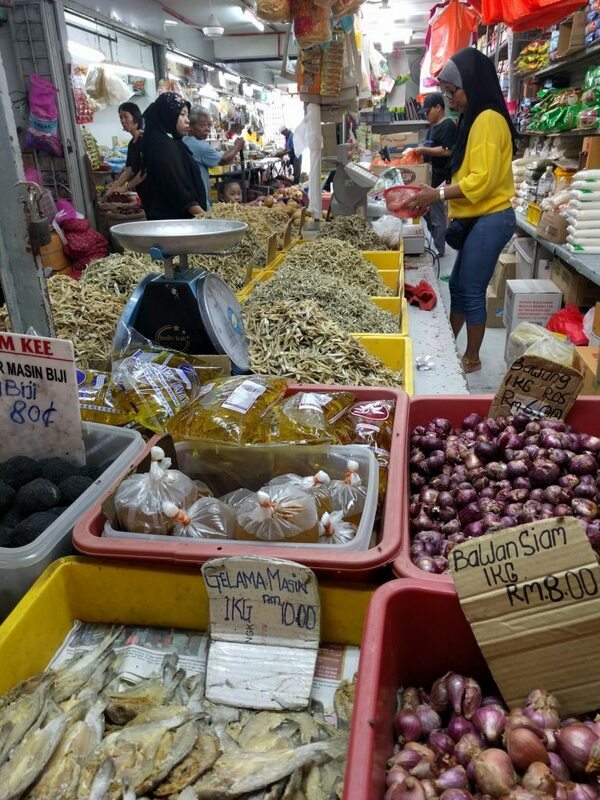 The Chow Kit Market has two separate parts: a wet market (selling fruits, vegetables, meats, and fish) as well as a dry market (selling electronics, clothing, apparel). The wet market section is not for anyone with a queazy stomach…we have pictures. 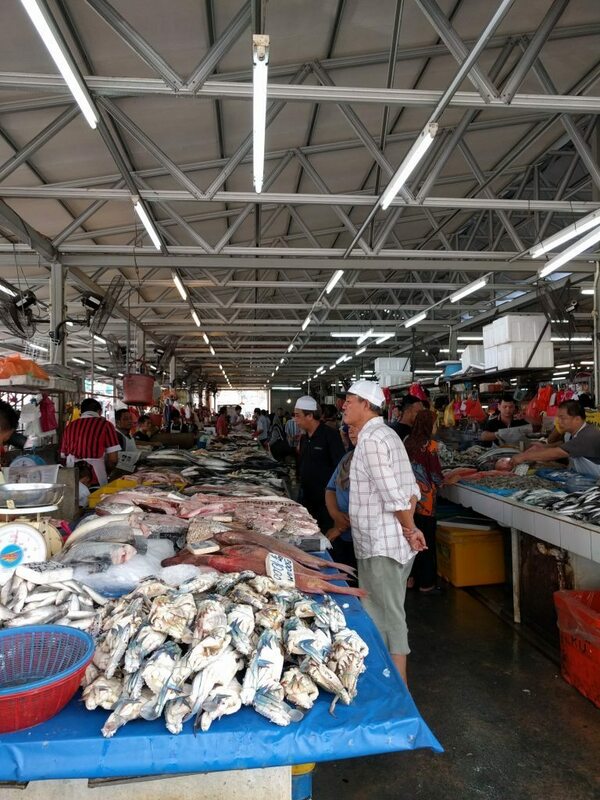 We entered on the wet market side, where we were immediately greeted by the pungent smell of raw fish and meats. This section was the largest raw meat section I’d ever seen. Fresh crab and so much seafood at the Chow Kit Market. 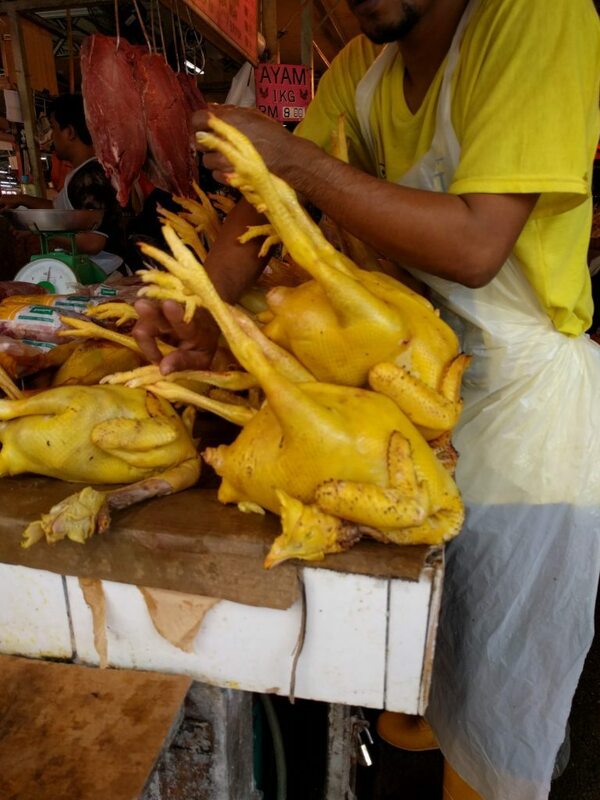 These yellow chickens were part to the meat section at the Chow Kit Market. I’m not sure why they were yellow. Beyond the meat section of the Chow Kit Market the market opened up to a different world of colors and smells…the fruits and vegetables. Intermingled with the fruits and vegetables stands were spice vendors and prepared food vendors. There was so much to choose from. We bought some fruit to take back to the apartment, then for our lunch we opted for some sort of indian-spiced meat and egg turnover that we had never seen before. It’s was so good! 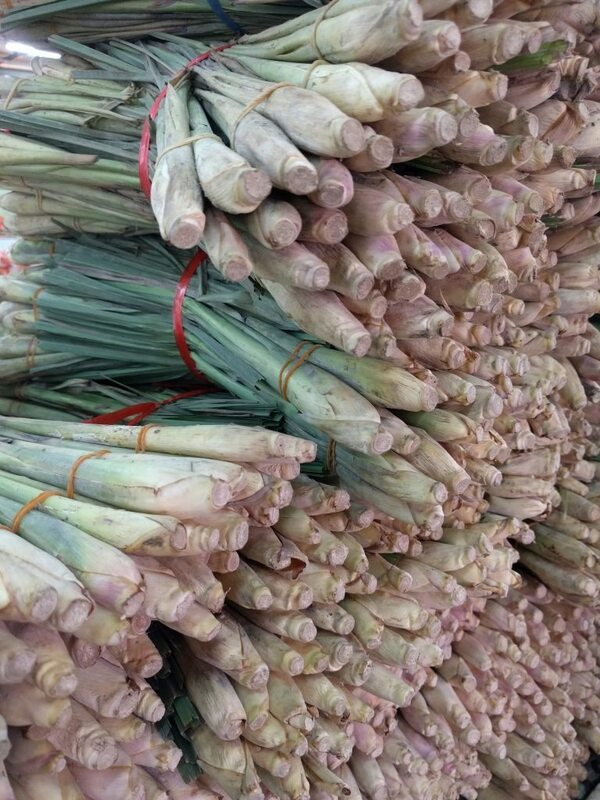 Lots and lots of lemongrass at the Chow Kit Market. This made my mouth water at the Chow Kit Market. 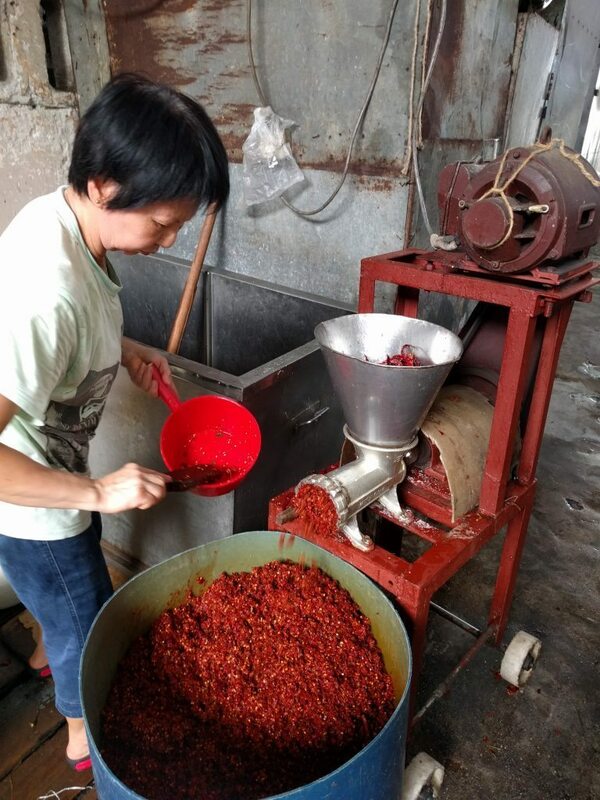 She was simply putting dried chilies that had been soaking in water into a grinder, and it smelled so good. So much dried fish. Who needs all that dried fish? Yummy stuff at the Chow Kit Market. This was kind of like a super thin pizza dough filled with indian spiced minced meat and egg. Again, yummy stuff. I’m not sure if I’ve mentioned it before, but Jannika and I are total food show dorks. So, after we arrived in Kuala Lumpur I searched YouTube for clips of Anthony Bourdain in KL. Jalan Alor was where he was eating., so Jalan Alor was where we went. 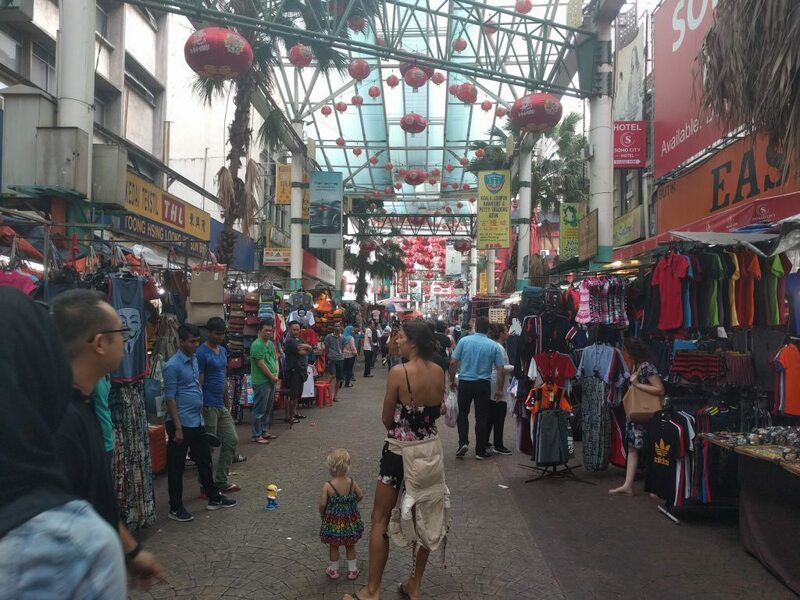 Jalan Alor Street is a randomly placed, fairly short street that is simply lined with restaurants on each side. 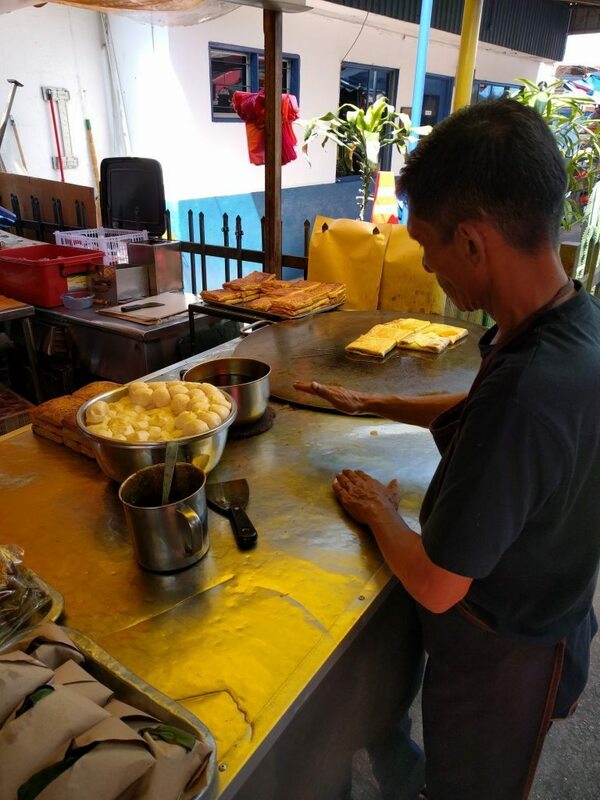 The restaurant seating spills out into the center of the street, so walking down Jalan Alor means that you’re bumping elbows with the callers trying to get you into their restaurant, and cars trying to navigate a street that really shouldn’t be open to vehicles in the first place. You see bbqed chicken wings, duck and pork in the windows of some restaurants, but the signature dishes of most feature the seafood… lobster, crab and shrimp are the stars. We made sure to order black pepper crab, which was one of the dishes I had seen Anthony Bourdain eating in the YouTube clip. 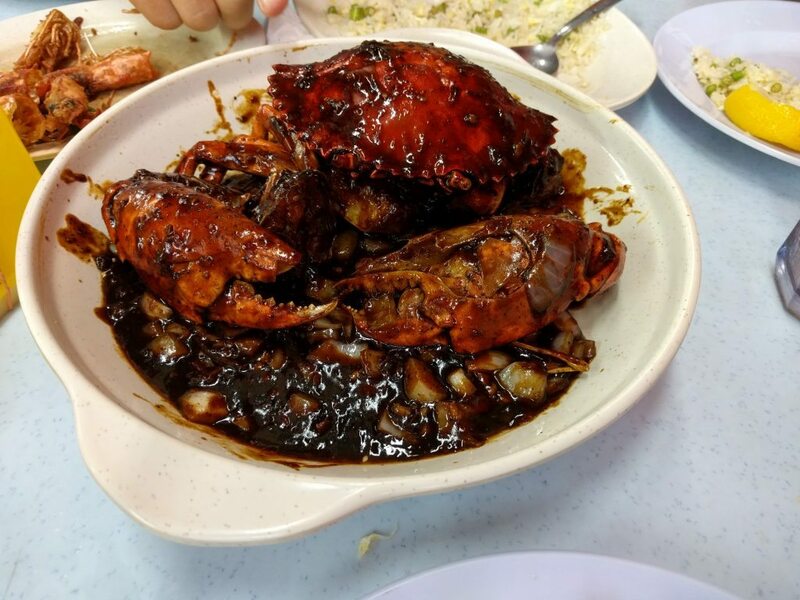 Black Pepper Crab in all its glory. Anthony Bourdain ordered this on Jalan Alor Street, so we did as well. It was delicious! This was the first lick of black pepper crab. 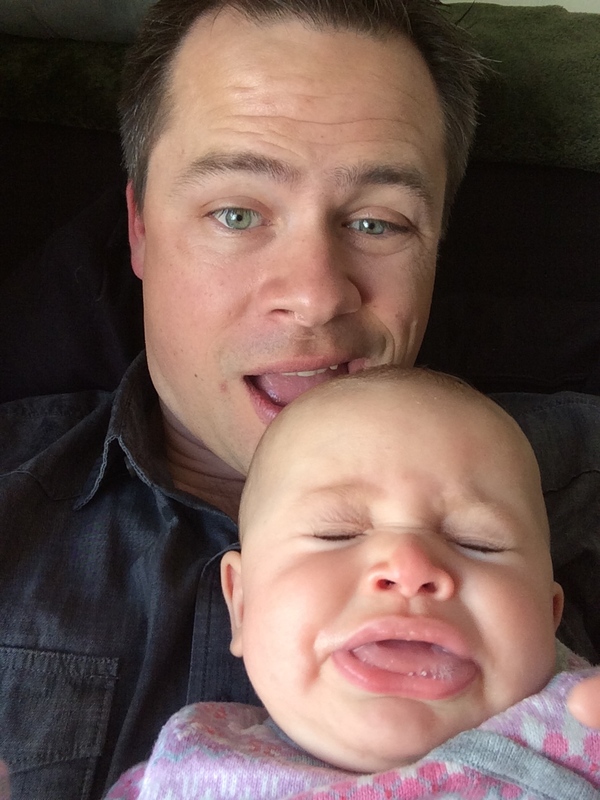 I was trying to keep it away from Freya because it was spicy, but she grabbed it when I wasn’t paying attention… she licked it and this was her face. 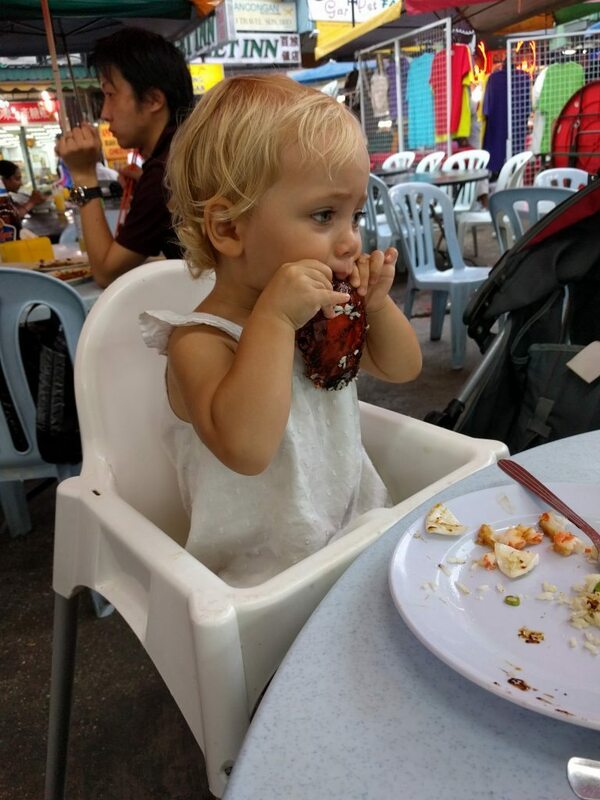 After her first face I thought for sure she would put down the black pepper crab, but noooo! She kept licking it, and loved it! 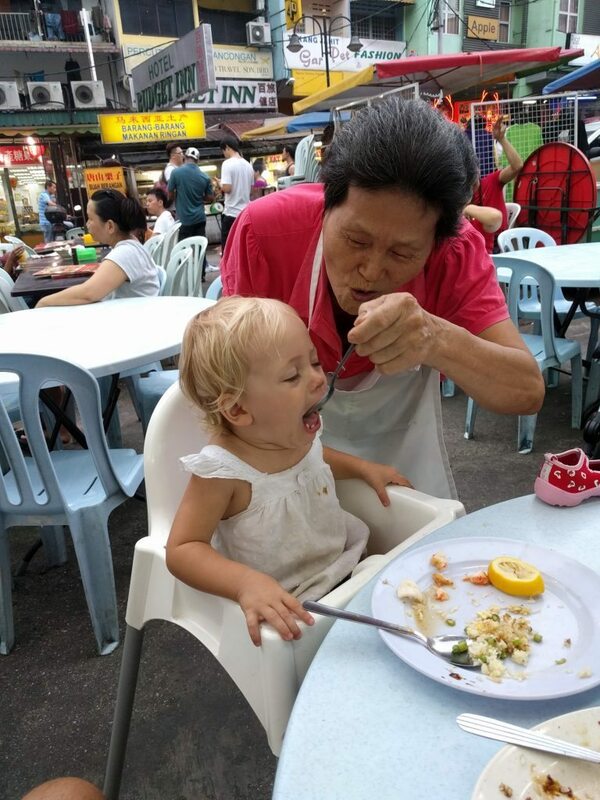 This old lady worked at the restaurant where we ate on Jalan Alor Street. She loved Freya, and loved that Freya loved the food. Another vendor pulling out the dancing Minion, trying to get us to bite. We were not lured by this technique. There was a pretty awesome food court down the first little alley near the entrance of Petaling Market. 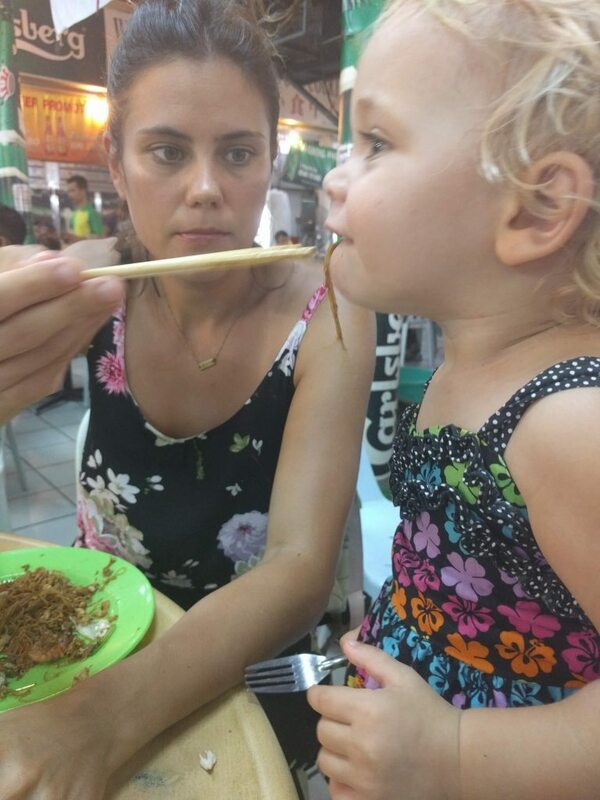 Freya had noodles. We usually try to seek out accommodations with a pool because Freya loves the pool, and it gives us a great escape from the heat and humidity. 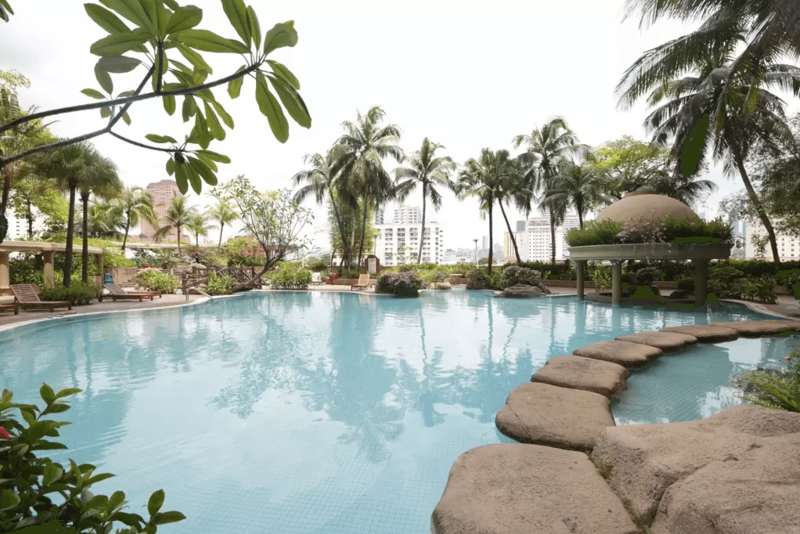 This pool was one of the nicer pools we’ve had access to on our travels. The pool was on the 3rd floor, and had a pretty amazing view. Freya loved jumping off the rocks into the pool. This was definitely one of the best apartment complex pools I’ve seen. There was actually a kiddie pool with a little water slide on the other side of those bushes… not sure why I didn’t take a picture. Thank you Pete, it’s so interesting to read. You’re really good write. Describing the environment in such a good way so I can almost see it or at least imagine it. So happy that Freya takes the trip so well. 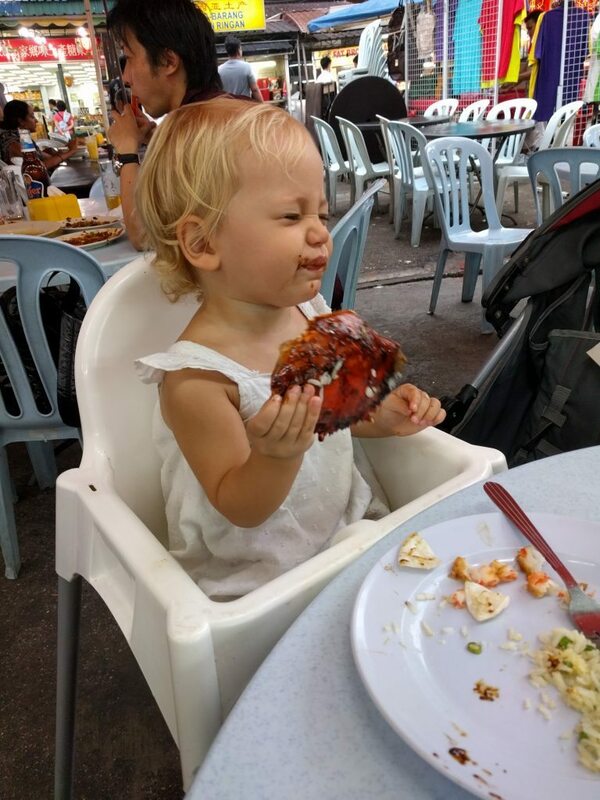 You got me laughing about Freya’s reaction on the spicy food. Hugs to all of you. Thank you Ljiljana. This trip has been so fun with Freya. Great pictures and text. Seeing the food courts makes me miss Phuket!!!! So happy I got to be with you for 3 weeks!!!!! I miss you all!!! Give hugs to each other and Freya from me!!!! Thank you mom! We miss having you with us. Our time around Phuket was amazing. Many more adventures and destinations to come… see you in Sweden soon!